Our dogs are the most patient, loving and stead-fast of family members. They get little respect and constantly must refine their coping mechanisms. 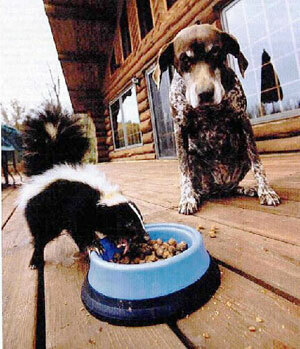 Even dogs have their limits, but it appears that skunks eating from one's bowl is not over the line. 6. You never have to wait for a dog - they're ready to go 24 hours a day. 9. A dog will not wake you up at night to ask, 'If I died, would you get another dog? 13. Dogs like to ride in the back of a pick-up truck. Or in the front with all the windows open. 14. If a dog leaves, it won't take half of your stuff! contain my food. Please note, placing a paw print in the middle of my plate of food does not stake a claim for it becoming your food and dish, nor do I find that aesthetically pleasing in the slightest. Also, I have been using the bathroom for years -- canine or feline attendance is not required. Don't hang out with drug-using friends. Don't have to buy the latest fashions. Don't need a 'gazillion' dollars for college. And finally, if they get pregnant, you can sell their children.